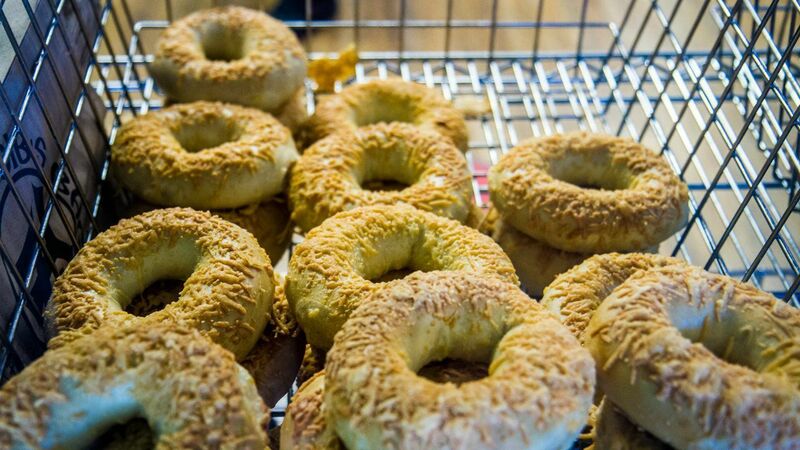 When creating the best bagel in Fort Collins, Colorado, the key is remembering that “the recipe is in the process, not just the ingredients,” says Mike Howland, owner of Gib’s Bagels. Our expertise in the preparation of authentic New York Style bagels is what makes a Gib’s bagel so delicious. Our bagels take 24 hours to prepare because of the several steps the dough must go through. If even one step is missed or fumbled, you will wind up with a bagel that can’t be served. We start with fresh, premium ingredients, including locally-produced Colorado wheat, to form our dough. After we knead and shape the dough, it is proofed at a low temperature for at least 12 hours. Once the dough has risen to perfection, the bagels are boiled in water to create that soft, chewy texture on the inside, and then baked in a stone hearth oven to create that crunchy texture on the outside. It’s a perfect New York Style bagel—served right here in Fort Collins, Colorado— each and every time! Of course the bagel itself, perfect though it may be, is just the beginning of a satisfying meal at Gib’s Bagels. When it comes to creating the perfect sandwich for our customers, our standards of quality remain high. Whether you crave our specialty cream cheeses made right at the shop, a savory breakfast bagel, or a fresh yet filling lunch, Gib’s Bagels uses only premium ingredients—including Colorado grown wheat, locally-produced dairy products, and delectable meats and cheeses—to turn out the best quality product possible. Twenty years ago, Brian Long, aka Gib, traveled from the East Coast in hopes of catching the best air while snowboarding the mountains of Colorado. A friend had been urging Gib to open a business of his own, and when he realized there were no bagel shops anywhere in sight, he started planning that day. Gib's original plan was to open a business in the mountains, but slowly he was directed to Fort Collins, where he was inspired to open a bagel shop that served the authentic New York bagel. Despite rejections from several banks, Gib continued to believe that there is always a way from point A to point B—you just have to dig a little deeper. The first Gib’s Bagels opened on August 25, 1994. In the past 16 years, Gib’s has grown to open multiple stores in Fort Collins, and has developed a wholesale business that delivers quality product throughout Colorado and into Wyoming. At Gib’s Bagels, we know that running a local business is not just about making a profit—it’s about developing lasting and meaningful relationships with each other and with our community. We believe that it is possible to work hard, be successful, and have fun at the same time. We take pride in knowing that we serve high-quality product in a fun and relaxed environment, creating the best possible experience for our customers, and this means you can pretty much bet on getting service with a smile! We recycle anything and everything we possibly can! We Are Proud To Be Locally Owned And Operated! As a small local business in the Fort Collins community, we at Gib's Bagels understand and appreciate the value of supporting local businesses. We are grateful for all the local support we have received over the years, and we strive to pass that same kind of support on to other local businesses and organizations. Uses locally-grown, Colorado wheat when possible in our bagels. Utilizes Clean Air Compost for recycling/composting needs. Please check out our Links and Past Donations pages to find out more about these and other friends of Gib's Bagels!